Feb. 20 speed networking event gives students a taste of the "real world"
The Feb. 20 speed networking event hosted by Career Services and Alumni Relations was a great success. 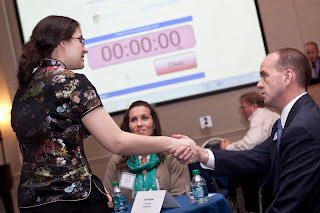 Students began the evening in the Lee Room with a crash course in how to network; the Career Services staff offered tips on introductions, handshakes and appropriate questions to ask during a networking event, among other things. The students, who registered in advance, also received 30 business cards that listed their names, contact information, major and year in school. 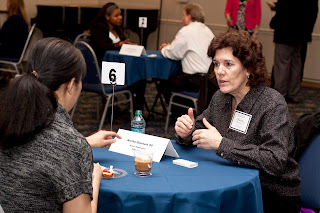 After visiting every table, students mingled with professionals at a dessert social. Over cookies, brownies, Rice Krispy treats and cupcakes, all agreed the evening was successful – and necessary in this economy. 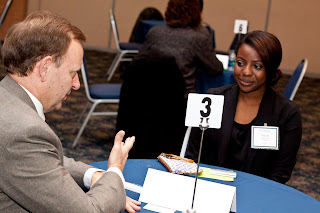 Friday, March 01, 2013 Chk out- Feb. 20 speed networking event gives students a taste of the "real world"